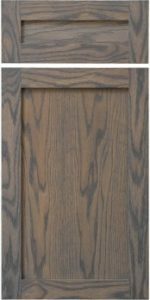 The TW-10716 is a veneered panel door which uses a 7/16″ thick veneered center panel to give the door a heavier feel than the simple 1/4″ thick veneer panel doors. It is important to note that the drop from the framing to the panel face is shallower on this door than a standard door (1/4″ drop instead of 3/8″). 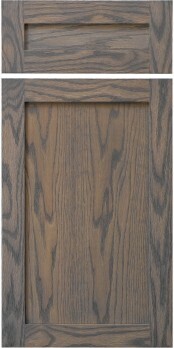 None - 7/16" veneered panel only. No - For mullions or frame only, order TW-10 door with: ME Edge, Square Framing Bead, and then frame only or mullion option as desired. Yes - Limited groove options. Door is not available with mullions. In order to receive mullions, door must be ordered as a TW-10. be sure to request narrower framing on the mullion door so that the framing matches that of the rest of the kitchen! uses ‘Tudor’ framing where the face of the door’s frame is narrower than the back. Any framing dimensions are as measured from the back of the door. As a result, the face of the door only has 1-15/16″ wide framing instead of 2-1/4″ as with our ‘normal’ mortise and tenon doors.